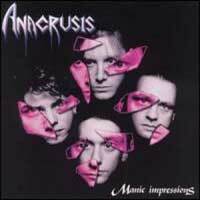 Anacrusis was formed in the late '80s in their home state of St. Louis. They were one of the more diverse metal bands of the '90s, and employed sophisticated harmonies and melodies but retained an aggressive thrash metal edge. "Suffering Hour" is one of those CDs that has been on my want list for years. This one I've actually had on for almost a decade now. For a while the band was offering free MP3 downloads of the album, which was cool. However, being the collector that I am, I prefer an actual copy of the CD to a download. 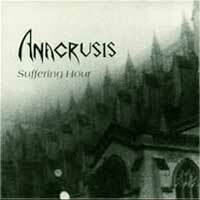 I've read that "Suffering Hour" has been released on CD by Metal Blade in 1990 (catalog number 7 72432-2). However, I have never been able to find a copy. My copy is the Axis Records bootleg. This bootleg has the lyrics printed in the wrong order, and has a tracklisting error: "Twisted Cross" is actually broken up into two separate tracks (tracks 8 and 9) and "Annihilation Complete (Disemboweled)" is track 10. Bringing the disc into iTunes, it labels track 10 as "Disembowled", which of course is incorrect. However, despite the error, it's not really that big of a deal. This CD really needs remastering and a proper CD re-issue. Until that time I guess the bootleg will have to suffice. The music contained on this disc is raw, abrasive thrash metal. In my opinion, some of the best thrash metal albums have always had a balance between fast, speedy riffs, and more mid-paced grooves. That is exactly what Anacrusis deliver on this CD. Some parts are just balls-to-the-wall speed, while others are more melodic in nature. If I had to compare the music here to someone, I'd say they have a unique sound that has some similarities to bands like Coroner or early Voivod. The song writing is technical and progressive, but not nearly as progressive and experimental as this band would get with their last two albums. The vocals are gruff at time, reminding me of some of the early Death albums, but there are these high pitched yells mixed throughout as well. Unfortunately the recording quality isn't that great. As I said above, this album needs proper mastering and a CD reissue. Progressive metal meets thrash once again, only a bit more mature, technical, and better produced than "Reason." Vocalist Kenn Nardi's has a unique ability to leap between growling and heavenly melodies. Reminds me of a mixture of Voivod and Believer. "Manic Impressions" was remixed and re-released by the band and was available for free download on the bands website, complete with new front cover art. EXCELLENT!!! Some of the best technical, experimental, progressive thrash ever! 9. "A World to Gain"
24. "A World to Gain"
Stormspell Records continues to release a string of fantastic classic thrash metal albums. This time around Stormspell has released a ton of early Anacrusis demos. 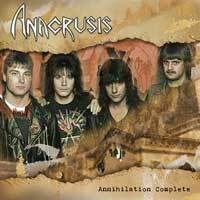 Long-defunct St. Louis, Missouri-based progressive thrash metal band Anacrusis released four full length albums before calling it a day in the late 90's. "Annihilation Complete" is a compilation of early Anacrusis demo material with the classic '87 demo "Annihilation Complete being the center of attention here. The original 9-song demo was chock full of aggressive thrash metal. Before morphing into the more melodic, progressive band that Anacrusis became on their last two albums, the band was much heavier and chaotic. Because of the production this album comes off as slightly heavier and darker than the band's debut, "Suffering Hour." Of course many of the songs that appeared on "Suffering Hour" also appear here, although there are some minor differences in the songs. One of the more immediately noticeable differences is in "Fighting Evil" in which vocalist Ken Nardi almost sounds like a young Rob Halford. These demos are the sound of a hungry group of thrashers playing as fast as they can without forsaking musicianship. The production is a bit raw, as would be expected from a compilation of demos, but aren't all that bad either. I've heard official albums from thrash bands in the 80's that sounded far worse. (Megadeth - Killing Is My Business anyone?) "Annihilation Complete" also includes a 19-page full color booklet that was written and designed by vocalist/guitarist Ken Nardi. Disc 2 is a DVD featuring 2 hours of vintage live footage.